Today I had lunch with a friend I had not seen since we graduated from seminary almost twenty-five years ago. It was a lovely time and it did my heart good to reconnect and fill in two and a half blank decades. She arrived at our house after I learned of the suicide of someone I knew (not well), worked with from time to time, and enjoyed. My friend has been a chaplain to children in hospice, so she knows her way around grief and shock. Over lunch I said to her something along the lines that sometimes the sadness is too much. She looked at me with empathy and knowing and agreed, yes. Sometimes the sadness is too much. But I have decided I will not let sadness win, or at least I will not let sadness be the only player in the game. I will not pretend that things aren’t awful, like cancer or suicide or addiction or the threat of nuclear war, but I won’t let those things have the only word. I’m looking for joy everywhere go, and now and then I see it. It’s usually pretty small, almost undetectable, so I have to look hard. I find joy in my daughter and husband and our terrier mix. I find joy in making art. I find joy in seeing the huge amount of food donations brought to church, and joy in all those advocating for the poor, for things like living wages and health care for all and truly affordable housing. It’s like there is a glass, and it has water in it, and some day it may be that all the water will be gone. But it may be that some day someone will refill the glass. But for now, there is water to drink. For now, joy is still competing with sadness and almost winning. The gifts of tulip and chocolate. It’s always a bit unsettling when things converge; it makes it all the more possible that there is a divine force guiding us – or so I choose to believe. If you’ve read some of my previous posts, you’ll know that 1) I invited people to eat chocolate every day for Lent as a reminder of God’s sweetness to us, and 2) that an old friend of mine was killed suddenly. To have put the invitation out on the first thing, and now to be wrestling with the second thing has made for an interesting juxtaposition for me. How do I contemplate the sweetness of God in the midst of sorrow and grief? Truth be told, because of the nature of this pastoring thing, I may be one half-inch further along on the whole theodicy thing (why a loving God allows suffering.) I don’t have any answers, but I am slightly less uncomfortable with the mystery of it all. And so the story that follows is not an answer in any way, nor does ease the chafing of points 1 and 2, but it’s a story and it has helped me. 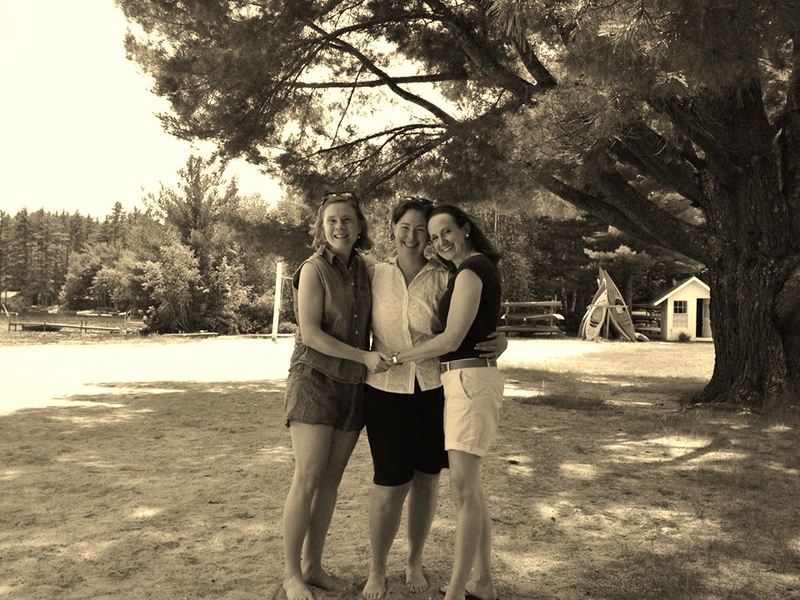 So, as I’ve written previously, my college friend Martha died last Friday. We lived together in a suite of ten our sophomore year, and in the days that have followed since the news of her death, we ten have been trying to get in touch with each other. On Monday I had a call from one of the other women from that suite, a friend who was an engineering major in college (I majored in art history), a friend who was a gifted athlete (it was all I could do to get the simple box step down in my forays into musical theatre.) We lived together but lived very different lives. We had not stayed in touch. Until Monday. Monday she calls me at the church; she lives in Portland, can she stop by for a visit? It was fantastic, and again I was so thrilled to see how this friend from my early adulthood had grown into this fabulous, generous, beautiful woman who gave up engineering and runs a non-profit that gives books to children. 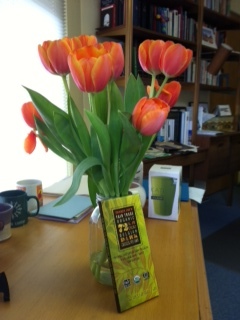 And here’s the thing: she brought me chocolate and tulips, because, as she said, that’s what Martha would have done. This old friend who had become a stranger to me is a friend once more, and the angel bearing chocolate – a sweet salve for my achy heart. May there be chocolate-bearing angels for you today. Today I learned that my friend Martha, one of my college roommates, died. She was hit by a car in Brooklyn just yesterday, and I don’t know more than that and am not sure I will choose to find out more than that. It is shocking, of course, when a friend from your youth dies. She’s too young to go, and by that, I also mean that I’m too young to go. We lived together in a suite of ten our sophomore year. With Martha, hilarity ensued, and often. We roomed together that one year, but not after that, and after college we lost touch. We reconnected a few years ago at our 25th college reunion, and then on Facebook. She blogged – “Desperately Seeking Jon Stewart” – and it was smart and funny, just like her. She had written kind and encouraging things to me about this blog, which pales next to hers. I was utterly delighted to discover how my college friend had grown into such a magnificent, talented, generous person. So it’s death again, knocking at the door, IM’ing me at a most inconvenient moment. Another untimely death at that, and the usual response: messages to other roommates around the country, missing the waste basket as I throw my soggy kleenex away, and wishing I could take her family some tuna noodle casserole or a Hefty bag of tortilla chips to get them through when the shock wears off. Grieving is such a patchwork – moments of utter loss, next to moments of the mundane. I shared the news with my husband, and got about to the rest of the day. Then dinner, then playing, then a family dance party. Katy Perry’s “Firework” came on, and I was belted out with the divine Ms. P, and suddenly was so overwhelmed I just put my face in my hands and wept. Yes, at Katy Perry. I was taken back to our 15th college reunion, when two of our other roommates, Anne and Emily, and I stood out in the athletic fields watching this incredible firework show accompanied by a live band. I remember standing there with my two dear friends, both of whom had married and had children, grateful for the blessing all these friends were to me. As I watched the fireworks, I thought about friends who had died, their lights had burst and delighted and illumined, and then they were gone. And now Martha is too. After college Martha was a producer for the PBS show “Clifford the Big Red Dog.” None of us who knew Martha was surprised by that. She won an Emmy for writing for the PBS show “WordWorld.” We weren’t surprised by that, either. She married, had kids, wrote, laughed, and made orange juice come out of our noses, we laughed so hard. So in her memory, I’m turning up the Bonnie Tyler. And I plan to do something hilarious and outlandish this week. I’ll keep you posted on that. I hope it will make someone laugh, if only myself, because a little too much has hit the fan this time.